Every year in early autumn, the Dutch film industry and public gather at the Netherlands Film Festival (NFF). Also this year, EFSP presents its own Unofficial Netherlands Film Star Postcards Festival from 20 to 29 September. Today in the spotlight: little Henkie Klein (1921-ca. 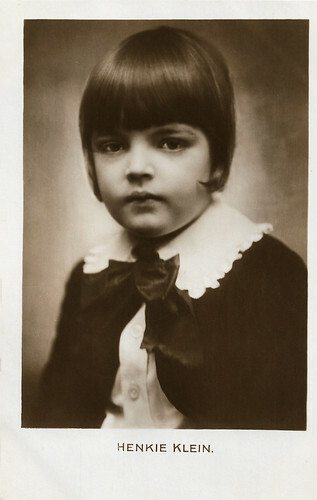 1993), who was a child actor in German and Dutch films of the silent era. 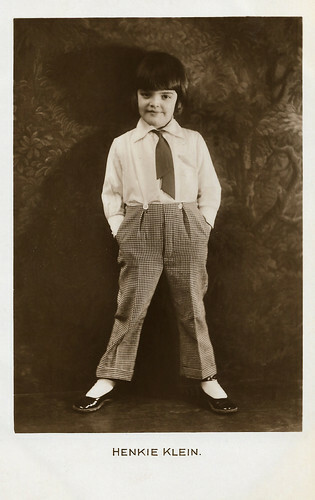 He was called the 'Dutch Jackie Coogan'. Dutch postcard by B. Brouwer, Amsterdam. Photo: Bernard Eilers, Amsterdam. Collection: Geoffrey Donaldson Institute. Henkie Klein (sometimes written as Klyn or Kleinman) was born in Amsterdam, The Netherlands in 1921. He was the son of film director Henk Kleinman(n). Some sources say Kleinman senior was Dutch, other sources say he was German born. Kleinman sr. was the producer and co-director of the German-Dutch film Die Fahrt ins Verderben/Op hoop van zegen (Henk Kleinman, James Bauer, 1924). This was the second film version of Op hoop van zegen/On hope of blessing, a classic Dutch fisher drama written by Herman Heijermans in 1900. The success of the production lead to another film based on a play by Heijermans, Die vom Schicksal Verfolgten/Droomkoninkje/Little Dream King (Henk Kleinman, 1926) with Wilhelm Dieterle (aka William Dieterle) and Aud Egede Nissen. Little Henkie played the lead of a boy born with a clubfoot who creates his own dream world. A year earlier Henkie had made his film debut as the Berlin street boy Bolleken in Goldjunge/Stille Nacht, Heilige Nacht/Golden Boy (Henk Kleinman, 1925) with Grete Reinwald and Carl Auen. Both films are now presumed missing. Dutch postcard printed by B. Brouwer, Amsterdam. Photo: Bernard F. Eilers. 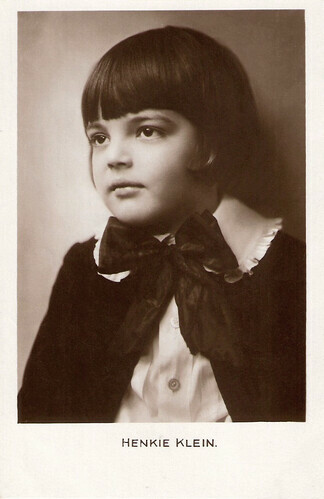 At the age of 9, Henkie Klein played in the melodrama Zeemansvrouwen/Seamen's Wives (Henk Kleinman, 1930), based on a play by Herman Bouber, author of popular plays like De Jantjes/The Tars and Bleeke Bet/Pale Beth. Zeemansvrouwen should have been the first Dutch sound film with some songs. Possibly because of a lack of money, it became the last Dutch silent feature film. The prints have been restored by the former Dutch Filmmuseum (now Eye Institute) and reviewer rohitnnn writes at IMDb: "Some of the shots in the film are truly exquisite, and though the story is almost entirely predictable, the film is eminently watchable as it shows us a glimpse of the society in a country that otherwise remains at the periphery of European cinema." Zeemansvrouwen/Seamen's Wives was one of the most popular films of that year in the Amsterdam cinemas, but Henkie would only act in one more film by his father, Hollands jeugd/Dutch Youth (Henk Kleinman, 1934). There is little know about this production. Kleinman senior also directed two other films, Zelfkant/Fag-end (Henk Kleinman, 1931), a short promotion film for the association for Help for Uninhabited, and the short Oudjes/Oldies (Henk Kleinman, 1936) with Louis van Dommelen, Riek Kloppenburg and August Kiehl. In 1934, Dutch film weekly Het Weekblad Cinema en Theater published a small article about Henkie: "In the last few years, we did not hear much of the young Dutch film star Henkie Klein. After his outstanding role in the Dutch film Droomkoninkje, he completely disappeared. This is probably because his father, director Henk Kleinman, does not get any more films to direct. Henkie visits the primary school in Amsterdam. He has almost become a Henk now." In Dutch newspaper NRC Handelsblad, Henk van Gelder wrote in 2003 about what happened to Henk Kleinman senior. Documents from film historian Egbert Barten show that Kleinman joined the NSB in 1934 and the Reichsfilmkammer in 1937 to be able to work in Germany. During the war he worked - again as Henk Kleinmann - in Germany for a small bureau that selected suitable German films for The Netherlands. He died in 1944 (other sources say 1945) without making another film in Germany. His train was bombed by allied forces and he died in a hospital in Berlin. An what happened to his son Henkie? Van Gelder cites theatre historian Piet Hein Honig who said that Henk Klein passed away circa 1993. Van Gelder contacted Henkie's daughter, but she just gave him information about her grandfather. In 2003, Zeemansvrouwen/Seamen's Wives was studied by lip readers and new film texts by Lodewijk de Boer were dubbed by actors like Huib Broos, Jeroen Krabbé, Nelly Frijda en Bram van der Vlugt. Henny Vrienten composed a new musical score for this film experiment. That same year, this final sound version was screened during the Biënnale in the Filmmuseum in Amsterdam. Sources: Henk van Gelder (NRC Handelsblad - Dutch), Peter Bosma (Dutch), Mariska Graveland (De Filmkrant - Dutch), Rohitnnn (IMDb), Dutch Film Angle, Wikipedia and IMDb. Last week Eric Palmen mailed me an article written by Henk van Gelder in 2003 for the Dutch newspaper NRC-Handelsblad. The subject of the article was the reconstruction of the sound version of Zeemansvrouwen (1930) by the Dutch Filmmuseum. Henk van Gelder wrote about Henkie Klein and his father: Curiously, because of all his experience, Henk sr. didn't play an important role in the Dutch sound cinema after Zeemansvrouwen. He only made a few small films on commission. He died in 1944, 47 years old. Piet Hein Honig, editor of the Acteurs- en Kleinkunstenaarslexicon (the Dutch Actors and Cabaret Artists Lexicon), informed him that Henkie Klein had died ten years ago (ca. 1993). Henk van Gelder then contacted the daughter of Henkie Klein, who told about her grandfather that he worked in the German film industry in 1944. His train was bombed by the allied forces and he died in a hospital in Berlin. Film historian Egbert Barten finally added the information that Kleinman became a member of the NSB (the Dutch fascist party) in 1934 and even joined the Reichsfilmkammer in 1937. Therefore he was allowed to work in Germany. During the war, Kleinmann (now written again with a double n) managed a small bureau that selected suitable German films for the Dutch cinemas. Source: Henk van Gelder, Mooie Leen snikt weer, in: NRC-Handelsblad, 18-4-2003. With thanks to Eric Palmen and Egbert Barten.